Support Federal Donuts’ mission, vision, and values by exhibiting the following behaviors: excellence and competence, collaboration, innovation, respect, individuality, commitment to the company, accountability and ownership. Manages the day-to-day operations of donut shops. Hires, trains, maintains employee relations, and schedules store personnel for standard store operating hours. Responsible for sales, controllable expenses (including payroll), security of store receipts, presentation, inventory control, loss prevention, and store appearance. Responsible for instilling in all employees a strong desire to deliver superior customer service to every Federal Donuts customer. 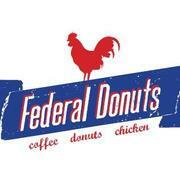 Promotes the Federal Donuts name and concept through the development of strong community relationships. Apprises Director of Store Operations of all store activities on a regular basis. Maintains all store fixtures and equipment are in proper working Maintains store cleanliness at all times.